Leading brands worldwide find value at Hero Conf. Join them. Check out how much people love Hero Conf! You’re guaranteed to geek out because our 6-step process ensures only the best speakers and content make it through to you. You're a paid advertising professional. It would make sense that you attend an event where every single session is focused on making you a better PPC marketer. With 4 times the PPC tracks as SMX or Pubcon, you'll get actionable content and innovative ideas that you can implement today. Don't be disappointed with a single session choice. You deserve it all! We've asked you what content you need, and we will have it delivered by only the very best. A Rigorous 6-step Selection Process ensures that you hear from the most innovative perspectives in the industry, session after session and day after day. We're not pay for play and never will be. Specially designed networking sessions ensure that every type of networker has a chance to meet new PPC pros every day. Informal lunch roundtables, workshop sessions, and interactive breakouts give you the interaction you crave at other shows. Don't feel lost and alone. Here, you'll come as an attendee, and leave as part of a community. Here at Hanapin Marketing, we've been running Hero Conf since day one. It was built because the PPC community was lacking a relevant learning opportunity. And if we aren't continually learning, we're falling behind. For 7 years, we've been focusing on our attendees and their long-term success, regardless of industry or role. You can count on real, invested customer service from the Hanapin team - before, during, and after the event. Convention Centers are sterile and uninviting. We've done it before and we'll never do it again. We strive to create an intimate, unique experience that the big shows just can't match. We host our events in unique spaces designed to give you access to the city and all that it entails. Because you deserve to feel at home. We've always been a step ahead of the rest, with unique networking, our Swag Shop, room drops, and local meals above and beyond the conference standard. The extras we provide push an already great event over the top. We're here to teach you a thing or two, but ensure you have a good time while we do. Because you're already a hero in our book. Famous as the birthplace of life, liberty and the pursuit of happiness, Philadelphia delivers countless things to do: fascinating museums, vibrant parks, national historic sites and famous (and delicious) food. Not to mention it’s an inspiring background to the PPC event of the year. This year we will be taking over the Philadelphia Marriott Downtown. Book your room to stay just moments away from the first keynote. Guaranteed rates expire April 8, 2019.
has a higher level of PPC content in the schedule. Why send a team to heroconf? Here at Hero Conf, we always encourage team time, but last year’s attendees can speak for themselves. Over 50% of attendees came as at least a pair, if not a team. We had 28% of attendees bring a group of three or more, and over 13% joined the conference with four or more colleagues. Why stop there when you can bring your whole team, which is exactly what two companies did! Want current numbers? So far, 50%+ of the 2016 Hero Conf registered attendees think it’s a good idea to attend with at least one other teammate! Need more reasons to bring your team to Hero Conf? Let us help. » For Company Training & Professional Development Continuous improvement is always the goal, right? Well there is no better place to learn than from the experts themselves. Use the conference time as a way to train rookies or expand your veterans’ knowledge. With a 5:1 attendee to speaker ratio, you and your team are guaranteed to get more questions answered. Encourage employees and colleagues to join you in gaining invaluable insights with actionable takeaways. » To Cover More Ground With over 40 breakout sessions offered, one person simply cannot absorb it all (as much as you may want to!). Bringing a team will allow you to divide and conquer Hero Conf London. Prearrange your sessions to ensure no one overlaps then come back to compare and share notes. It will be like you heard it all! » Because Content is Rich & Conversation is Richer Of course we pride ourselves in the depth of our content, but applying what you learn is the ultimate goal! After you reconvene from the divide and conquer (see To Cover More Ground), work with your team during a coffee break or the bar takeover to discuss onsite how to implement what you’re learning and engage in the PPC world around you, together! 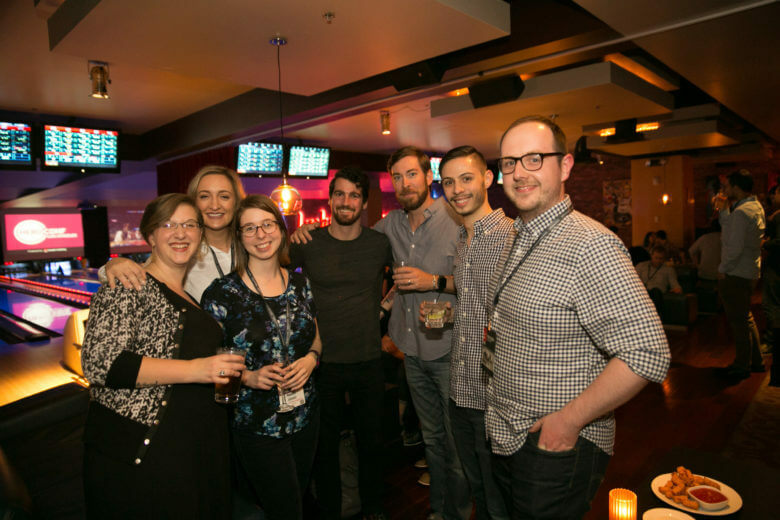 »To Bond with your Team Spend some time with your team doing something other than work while you enjoy yourselves at our 5 separate drink receptions & after hour activities! We come to Hero Conf to learn more about the industry we love, but the evenings are reserved for catching your breath. Let loose with your colleagues and get to know one another away from office. Last year we were thrilled by your enthusiasm to bring your team to Hero Conf, so this year, we’d like to reward you for doing so! Receive 10% off each registration when you bring a team of 3 or more! Group pricing applies to the conference pass only. Email us for your group rate discount code!